Dozens of people have been killed and scores more wounded as five suicide car bombers detonated explosives at a military base in the city of Gao, northern Mali, according to a government statement cited by local state media. On Wednesday, at around 9 am local time, a car packed with explosives entered a compound where a meeting of government and pro-government forces was taking place. Minutes later, the five occupants detonated the bomb. The office of Mali's president late Wednesday put the provisional death toll at 60, with 115 wounded, AP reported. 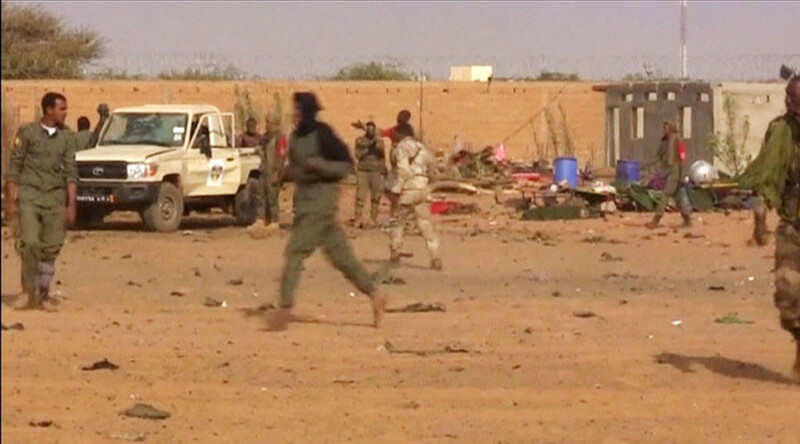 Al Mourabitoun, a militant group affiliated with al Qaeda, has claimed responsibility for the blast, the Mauritanian news agency Alakhbar reported. President Ibrahim Boubacar Keita has declared three days of national mourning in the aftermath of the attack, the worst to hit the Saharan country in years. Premières images qui nous parviennent de #Gawa, plusieurs morts suite à l'attentat à la voiture piégée. The Gao base houses the Joint Operational Mechanism for regional security, through which government forces and local militia coordinate joint patrols of the area. The area around the compound is supposed to be secure, with checkpoints manned by UN, French and Malian troops. The French President François Hollande even toured the base days earlier. French Interior Minister Bruno Le Roux described the bombing as a "major and highly symbolic attack." As the number of victims rose throughout the day from the initially reported 25 deaths, staff at Gao’s hospital had to prioritize as the casualties mounted from the explosion. In recent years, Mali has been hit by conflict with both Islamist rebels and ethnic Tuareg separatists. A peace treaty was been signed with the secular Tuareg groups in 2012, who subsequently joined forces with the government to fight al-Qaeda-linked militants, who had been seizing territory and imposing Sharia law on the towns and villages they controlled including the ancient city of Timbuktu. From 2013 a French intervention successfully drove back most of the Islamist factions, however,terrorism and banditry continues to plague the north of the country.